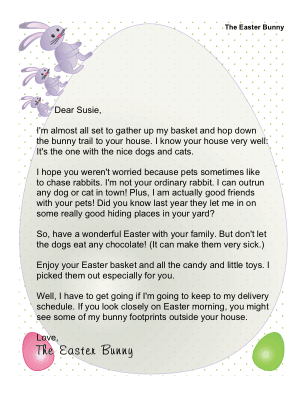 This humorous letter from the Easter Bunny is ideal for a child with pets, as it lets kids know not to worry that a dog or cat will scare the rabbit during his delivery. 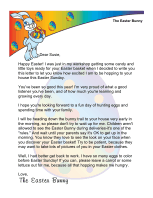 I'm almost all set to gather up my basket and hop down the bunny trail to your house. I know your house very well: It's the one with the nice dogs and cats. I hope you weren't worried because pets sometimes like to chase rabbits. I'm not your ordinary rabbit. I can outrun any dog or cat in town! Plus, I am actually good friends with your pets! Did you know last year they let me in on some really good hiding places in your yard? 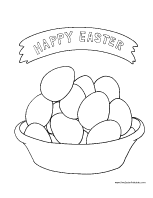 Enjoy your Easter basket and all the candy and little toys. I picked them out especially for you. Well, I have to get going if I'm going to keep to my delivery schedule. If you look closely on Easter morning, you might see some of my bunny footprints outside your house.